On behalf of Val, Jo and Lisa, I welcome you to this requiem mass in the parish church of John Thomas Hassett. We gather to pray in thanks for John's life. John asked that we gather to ask God's mercy on him and to thank God for the many blessings bestowed on John during his 81 years. John was a good man, a good husband, a good father, a good grandfather, a good great grandfather, a good lawyer, a good judge, a good advocate for social justice, a good Christian, and a good Catholic who touched the lives of many. Last time I was in this church was almost three decades ago when John was walking daughter Lisa down the aisle for her marriage to Warren. In those days the church was very boxy; now it is open, light filled and inspiring. I first met John almost four decades ago when I signed the bar roll here in Melbourne. I was John's pupil. He was my master barrister. One of the highlights of John's practice in those days was the Warrnambool circuit. I accompanied him a couple of times. He would go down with a bundle of briefs for plaintiffs suing the Fletcher Jones Clothing Company where they had suffered work injuries. One day John opened the wrong case before the jury. Only he could see the funny side of all this. His Honour was not amused. John could always find humour where others would find only despair and human failing. It was one of the graces of his life. One evening on the circuit, the newly minted QC Bill Gillard announced a circuit custom that a junior barrister would pay for the white wine while the 'silk' would cover the cost of the red. John called for the wine list and promptly ordered a modest white and the most expensive red on the menu. It was a well-aged Penfolds St Henri Claret. John knew there was more than one way to interpret and apply a custom regardless of how novel or hallowed it might be. Another occasion on circuit, I was staying with Monsignor Fiscalini. It was Ash Wednesday. John and I attended the early morning mass. The ashes were applied to our foreheads. By the time I turned up for court, I had wiped my forehead clean. John was one of those old time Catholic traditionalists who liked to leave the ashes on until they wore away during the course of the day. And besides, he told me, there would be no harm in having a Warrnambool jury seeing counsel for the impecunious plaintiff against the employer corporation wearing the morning's ashes. He knew more than his prayers. After he retired from the bench, John was a great advocate for the vulnerable who missed out on all sorts of political and economic fronts. He was not only an advocate but also a practical helping hand. The members of the local St Vincent de Paul conference will form a guard of honour today as a tribute to his ever-helping hand. John would often email people about the injustices being suffered by refugees and asylum seekers. But back in August 2014, John emailed me saying, 'We had our first trip to Europe earlier this year to celebrate our 50th Wedding Anniversary.' He went on to say, 'I had a great retreat at Campion over the weekend on the topic 'The Fourth Quarter' lead by your colleagues Patrick O'Sullivan and Michael Smith and I am much recharged by it to see out the final quarter of this life.' And he was. Now he has seen out that last quarter. And in all four quarters, we can say that he played his personal best, and he gave his all to others. Everyone who has spoken of John in recent days has attested his care for all, his generosity, and his commitment to justice for all according to law, and social justice for all, including the most vulnerable. And always with a touch of humour — at times quite inappropriate humour. We were joking on Saturday that he is probably not yet through the pearly gates as he still has so many of those appalling jokes to share with St Peter. Each joke and each act of advocacy would be delivered in those dulcet tones by the one who was so often the voice for the voiceless. John knew that many of his friends and professional colleagues professed no religious faith. But he never treated them any the less, let alone as lost causes. He was unfailingly respectful and would be so delighted to share this mass with those of his colleagues and friends who are unbelievers or of a different faith. He was dedicated to his church in good times and in bad, at the local parish level and nationally. 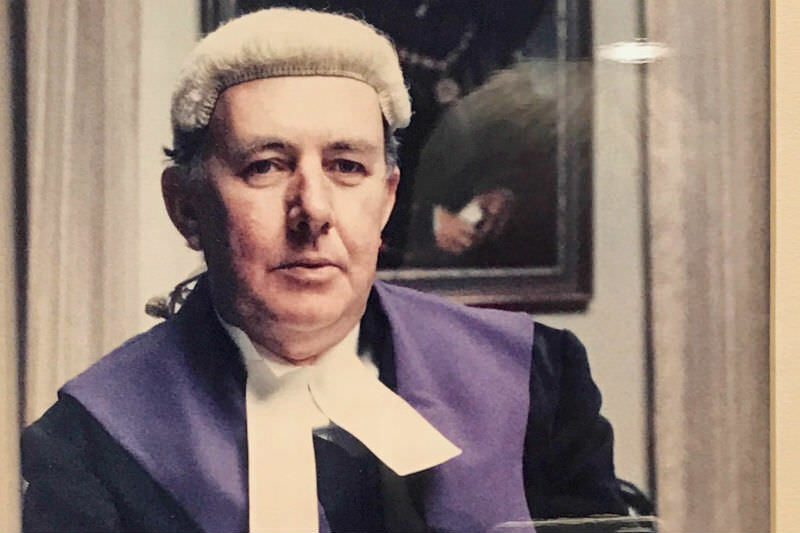 Having retired after 15 years as a County Court judge, he chaired the Melbourne Archdiocesan Commission for Justice Development and Peace and was a Victorian Representative on the Australian Catholic Social Justice Council. Whether tending to the extended family or advocating for social justice, he was motivated by love which is patient, and kind: 'It does not envy, it does not boast, it is not proud. It does not dishonour others, it is not self-seeking, it is not easily angered, it keeps no record of wrongs. Love does not delight in evil but rejoices with the truth. It always protects, always trusts, always hopes, always perseveres.' That was John to a tee. John was a great one for collecting writings of theological and philosophical wisdom. Inside the front cover of the funeral booklet, painstakingly prepared in every detail by John as you would expect, are the words: 'The Kingdom is not only beyond our efforts, it is even beyond our vision.' This didn't stop John hoping; it didn't stop him striving, and it didn't stop him believing. Let's console each other in our grief with the assurance that this good man has now gone to his eternal reward. We join our prayer with his and that of the saint and knight of the realm, Thomas More: 'Pray for me as I will for thee that we may merrily meet in Heaven.' Amen.